The racing community came out in force on a chilly December night to support the First Annual Eddie Brann Memorial Race at Citrus County Speedway. This would be a night that gave race fans and racers alike the chance to celebrate the life of Eddie Brann and pay tribute to his tireless passion for racing, while also raising funds to support his family, especially his young daughter Alyssa. By the end of the night a check for nearly $8,000 had been presented to Eddie’s wife Barbie, with more hoped to follow once a final count could be made, and the fans had been treated to a night of great racing headlined by a tremendous race featuring one of the most impressive line-ups of open wheel modified racers seen in the Southeast this year. The races on Saturday night were just the finale of a whole weekend that had seen the drivers start assembling on Friday afternoon, braving the unseasonably wet weather but knowing that nothing was going to prevent this race from going ahead. By Saturday the skies had cleared, practices had been scheduled and the cars were out onto the track for final tuning and testing before the crowds were let into the stands and qualifying could begin. With 36 cars making their way out of the pits to be squeezed onto the infield roads, it was the #98 of pre-race favorite Robbie Cooper who set the fastest lap, with Tony Carreno’s #61, being driven for the night by Wayne ‘Rocket Man’ Jefferson close behind him for second place. Such a large field meant that more pruning was required to get the field for the main feature race set, so the top 18 fast qualifiers went straight through to the feature, and two B-Main heats would be needed to fill out the field, with each heat race bringing the top 3 into the feature, leaving 2 remaining spots to be filled at the promoter’s discretion. Both heat races had their fair share of action as the drivers fought to make it into the feature for this evening of racing and tributes to their lost friend and colleague, with the second heat in particular seeing a number of cautions for spun-out cars, a problem ultimately diagnosed as being due to oil on the track that would need a lengthy clean-up before racing could continue. But with the heats completed and their winners confirmed as Pat Nanney and Sammy Coghill, the field of 26 starters was now set for the main event. The modified feature race would be run over 78 laps – an unusual number for a race, but necessary because the outpouring of support from the racing community for this night meant that sponsors still kept coming forward once the 75 scheduled laps had been sold, so an extra 3 were added just to help add to the pot of cash going to Eddie’s family. Once out on the track it was revealed that after qualifying the front 5 rows had been inverted, putting Cooper and Jefferson back onto the 5th row, giving #89 Lee Collins the inside pole position from the start, with 16yr old Colin Cabre in the #51 to his outside. Before the racing could start an emotional pre-race ceremony saw all the racers introduced to the crowd and the people who had come together from across the Florida racing community to put the race together thanked for their hard work, before the microphone was handed to Barbie Brann, to give her own memories of Eddie, his love of racing, and to thank everyone on hand for their support. It was left to Barbie to give the famous command to fire the engines, and slowly the cars roared into life to begin their slow laps around the track, signally the green flag was soon to be waved. The fans in stands didn’t have to wait long before the race exploded into action, with the green flag still waving and the rear of the field still crossing the start line when the cars screamed into turn 1 still in double file. As the cars came together mid-turn, contact between #98 Cooper and #119 Scott McDaniel saw both cars turn, but Cooper being left stranded sideways in the bend making him a sitting duck for the oncoming traffic. With 5 cars getting tangled up in the aftermath it was Cooper who came off the worst, ending a race he was a definite favorite for and had qualified fastest for by taking a heartbreaking ride down into the pits on the chains of the wrecker with barely ¼ of a lap completed. He would be joined in the pits by #7 Timmy Moore, but the other cars who featured heavily in the wreck, including #22 Sammy Coghill, were able to pull themselves clear and continue around for the full restart. The restart saw things calm down considerably, but even with 78 laps ahead of them the drivers were nudging and bumping their way through the pack knowing that with this many cars on track the fewer cars in front of you, the more chance you had of avoiding trouble. These early stages saw Collins make the most of his pole position to make a slight break away at the front, and by the 5th lap he was being chased by #6 Dwayne Dempsey, who had slipped inside Cabre with #87 Keith Lilly following him through to take 3rd and relegate Cabre down to 4th. By the 10th lap the cars had finally settled down to single file around the track and Dempsey and Lilly were already making ground on the leader Collins. The caution flags were soon out again when this race at the front got a little too close as Dempsey bumped the rear of Collins heading out of turn 4 to cross the line to start lap 15, but in turn Dempsey felt the nose of Lilly’s car from behind immediately afterwards, causing Lilly to get out of shape and spin out. After a brief caution the racing was underway again but this green flag period lasted just until lap 18, when another big crash going into turn 1 had a big effect on the outcome of the race. This incident began with the #56 of James Wright getting out of shape coming down the front straight, meaning the contact by #07 Jeff Scofield was more than enough to completely turn Wright’s car. At such a fast part of the track, and with the cars still in such close proximity to each other, a big crash was inevitable and so it was that a number of cars were left with nowhere to go, the #0 of Troy ‘Batman’ Robinson perhaps coming off worst as he hit the stranded Scofield to go up onto his side before slamming down hard in turn 1 and seeing his car damaged beyond continuing. Scofield would suffer a similar fate, having been hit by so many of his fellow racers as the crash developed, and he would leave the track up on the wrecker chains with a very badly bent modified racecar. The effect of this big wreck was to stack the cars back up together again for the restart while also lessening the field out on the track. As the pace car pulled off it was Collins again who was able to pull away at the front, but by now he had the patient Jefferson in the #61, who had bided his time in the chasing pack for the race to settle down, very firmly in his rear view mirror and bearing down on him. After leading 22 laps from the start Collins finally had to give up his position as Jefferson shot down his inside out of turn 4 as they came round for the 23rd lap and although Collins immediately fought back he was soon relegated further down the field thanks to #119 McDaniel’s brave dive down the inside of turn 1 a couple of laps later. The race now finally settled down into a groove as Jefferson and McDaniel made the running up at the front, leaving the midfield pack to battle for the minor placings amongst themselves. Good fights for places began to develop, with plenty of contact and bumping for the fans to keep an eye on as the race continued. Another caution period would be necessary around the half-way mark as #70 Jeremy Gerstner came to a halt in the middle of the first corner as a result of one of these battles, this one amongst the cars pushing for 3rd place. The restart saw a new name coming into the picture as the #42 of Richie Smith started to make a move through the field and was quickly challenging #01 Curtis Neumann in a race for 3rd spot, with #03 Kyle Bookmiller close behind and ready to capitalize on any mistake ahead of him. Smith would soon drop out of the picture when he lost grip going into turn 1 starting the 42nd lap, taking a brief excursion across the infield grass before re-entering the track a number of places back in the field, and leaving Neumann and #199 Shawn McLaughlin to battle for 3rd. The quality and speed of the cars on show was underlined by the fact that even on the short but fast ¼ mile oval it took until the 46th lap for Jefferson to lap the last placed #13 Jon Didges for the first lapping of the race. Jefferson would now start to move his way through the slower cars, but his progress was again temporarily halted when contact between #42 Smith and #112 of Eric Rudd saw Rudd spin out in a cloud of tire smoke to bring out the pace car and bunch the pack back up again. With less than 20 laps to go the race restarted once more, but the cars would again be under caution for another spun out racecar on lap 69, this time meaning the race would come down to a 10 lap shootout for the trophy. Jefferson again kept his cool as the green flags waved and was able to keep his distance ahead of McDaniels, who in turn had enough pace to keep clear of Neumann and McLaughlin and their fight for 3rd place. Of course the race had one last twist to be played out, and so with just 5 laps remaining the caution flags and yellow lights were again on display after Gerstner and Rudd came together in turn 2 leading to Gerstner spinning and leaving Rudd with a flat front tire. Now it really was all out for a race to the checkered flag, so Jefferson had to compose himself for one last push to make sure that his hard work and his great tactical race didn’t leave him empty handed. Straight from the green flag Jefferson flew away at the front, showing the pace we had come to expect from the Rocket Man when given this kind of chance to seal the win. McDaniel followed closely behind but never close enough to force a move or look either side of the leader in the remaining laps, and so Jefferson was able to hold on and take the checkered flag to win the race he had been leading since lap 23, with McDaniel in 2nd and Neumann and McLaughlin in 3rd and 4th behind them. Racing being racing, the order out on the track is not always the way the results ultimately go, and so it was with this race as the tech inspectors did their last checks of the season on the placed cars, and their inspections seeing McDaniel DQ’d, pushing Neumann into 2nd place and McLaughlin into 3rd, with #03 Kyle Bookmiller and #4 David Foster rounding out the top 5. A fitting winner for the First Annual Eddie Brann Memorial Race as he had not only been a great friend of Eddie Brann’s but was also piloting the car of Tony Carreno, one of the driving forces behind the whole event who had worked so hard to make the weekend such a success. But the big 78 lap modified race was only part of the evening’s race program. The night had kicked off with 50 laps for the 4 cylinder Bomber division. This race had started the night off well with plenty of excitement and lots of passing. Despite their smaller stature and engines the Bomber drivers happily put on a show that saw early cautions for big crashes by #171 Wayne Heater and #65 Happy Florian, who both hit the front straight wall hard enough to require trips back to the pit on the wreckers on consecutive laps. The main racing would come from #69 Shaun Cater, #13 Mike Ogren and #32 Jeremy Sharrone, with Cater taking the checkered flag after taking the lead on the 2nd lap and never looking back, with Sharrone and Ogren in 2nd and 3rd behind him. Due to the need for qualifying heats for the Modified feature, one of them seeing a major track clean-up required, the Sportsman feature was reduced to 35 laps and ran its entire length under the green flag with no stoppages needed. This race was won comfortably by #17 Mike Bell who took control of the race right from the start and by the end had lapped more than half the field at least once, closing down on the 4th place car by the end. Bell was followed by #15 Joey Catarelli in 2nd and #56 Kevin Macy in 3rd. Right before the main event of the night the Street Stocks got to take 50 laps around the track, and from the start the #42 of Richie Smith grabbed control of the race and flew into the lead. As with all street car divisions racing at tracks across the country, the racers showed they weren’t afraid of contact and bumped and barged their way through the field, bringing out numerous cautions usually due to a combination of hard driving and loose grip in the corners. Smith would ultimately take the checkered flag ahead of #8 Jeff Stalnaker and # 58 Larry Welter Jr with just half of the field running by the end of the race. 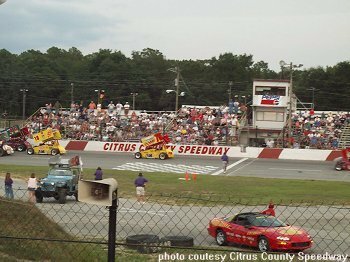 The whole evening was closed by a field of 11 Figure 8 cars racing through the Citrus County Speedway infield, bringing gasps from the crowd with every trip through the crossover at the center. All the early running was made by #74 Bob Hage, but once he was caught and passed by #14 Wayne Calkins, it was Calkins who raced away into the distance and never looked back – or across! Despite a few near misses the racers managed to complete the race without a major wreck, with Calkins an easy winner up at the front, followed by #18 Mike Cherry and #39 Robbie Hage. 7 58 Larry Welter Jr.
26 58 Larry Welter Jr.
Street Stock Ernie Reed Jr.
LATE MODEL HERB NEUMANN, JR.
Limited Sportsman Herb Neumann, Sr. Figure Eight Ron Schriefels, Jr.